As a SaaS company aiming for growth, you are probably focused on getting more customers, but are you aware that if you can’t keep your current customers getting new ones is a Sisyphean endeavor? When a SaaS company expands its business operations, customer churn grows organically. A high churn rate will have a negative impact on SaaS revenue, profitability and valuation. SaaS Capital pointed out that a 1 percent difference in churn can have a 12 percent impact on company valuation in 5 years. So a positive change of 5 percent or more can bring down your company valuation by more than 50 percent. A high revenue churn will have a negative impact on your company’s finances. Here’s the thing: there are no tactics that can help keep a crappy SaaS product afloat. The SaaS business model is based on customers renewing their subscription, which means that getting them on board isn’t enough; you have to also make them stay there. How do you do that? By making sure that your product adds real value to their lives. 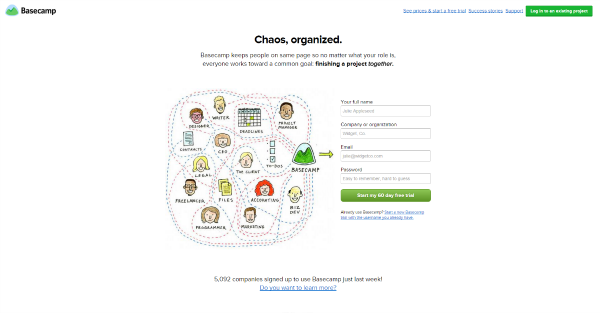 Take a look at 37 Signals, now known as Basecamp. You know why it became such a success? Because they made a product that was way better than anything comparable on the market at the time. Sure, there was more to it than that, but when their project management software came out, people were blown away by it. Easy to understand, easy to use… 37 Signals made sure that managing a remote team wasn’t a headache anymore. Products that add real value to the lives of people practically sell themselves. So, before you start implementing all the different churn reduction tactics, make sure that you have a solid foundation to build on. And that solid foundation is having an amazing product. A SaaS business model is often seen as the holy grail of entrepreneurship. Affordable production costs, scalability, niche market. These factors have led to the huge expansion of the SaaS industry. ChiefMarTec revealed there are 1875 marketing technology companies in 2015, up from 947 last year. Expansion of companies is seen in almost every segment including human resources, productivity, finance, and engineering. So being a SaaS company in 2015 doesn’t give you a competitive advantage; it just places you in the league. You have to get in your prospect’s head, brave the throngs, and differentiate. So how can you stand out in such a crowded marketplace? Answer: You have to know what your competitive advantage is. When KissMetrics launched, Google Analytics was already leading the web analytics software niche. It was easy to use, reliable and, most importantly, free. But KissMetrics had a competitive advantage – they offered software that not only showed the metrics, but also helped website owners to understand how these metrics translate into revenue. That’s what allowed KissMetrics to not only survive but thrive despite all the competition. Why should people choose your product instead of going with your competitor’s offering? Make sure that you offer something that differentiates you from everyone else in the market. Remind customers of your unique value proposition to increase your chances of retaining them. It’s quite likely that you are losing a lot of customers during the onboarding process itself. The process starts from the first call-to-action a customer sees, and can expand over a period of time to make the customer continue using your service/app. The onboarding process should be made as easy, simple & clear as possible. Even minor tweaks can help customers take action. Magoosh wanted to see how a welcome message affects conversions, so they A/B tested it. It turned out that users who got the welcome message converted 17% better. That’s quite a bit of an impact for a simple tweak, right? Analyze your onboarding stats. Where do people stumble and give up? Ask yourself how you can make things easier for them. Keep in mind that a great onboarding process is one that is quick and painless. Do you know the process behind relationship breakups? People don’t just wake up one day and decide to break up with their significant other. Usually, problems arise a long time before the decision, and the person who decides to break up thinks for quite a while before pulling the plug. This could be avoided, however, if problems are addressed when it matters the most. And guess what? It’s exactly the same with companies. Users don’t just wake up one morning and decide to leave you. They are usually unhappy for quite a while before they decide to cancel. But, just like with real-life relationships, if you manage to identify and address the problems in time, you stand a chance of continuing to do business with them. These could be some red flags indicating that certain customers are about to churn soon. By segmenting the customers behind these red flags, you can work towards mitigating the churn. When Groove looked at their data, they discovered 3 major red flags for the first 30 days of their customer lifecycle: length of the first session, frequency of logins, and time spent on certain tasks. Groove then took actions to address these red flags. First, they reached out to people who didn’t complete the onboarding process. Second, they contacted people who haven’t logged in for a while, encouraging them to login. Third, they checked in with people who seemed to be struggling with setting up rules and widgets, and offering them help. Unsurprisingly, Groove’s extra attention to “at risk” customers led to a reduction in the churn rate, which helped the company’s bottom line. Take a look at your own data. What are the common things between people who stay and what are the common things between people who leave? Don’t wait for your customers to break up with you – always keep an eye out for red flags and do your best to save customer relationships. The basic idea is to ensure that existing clients remain active and engaged, which is the way to win recurring business from them. 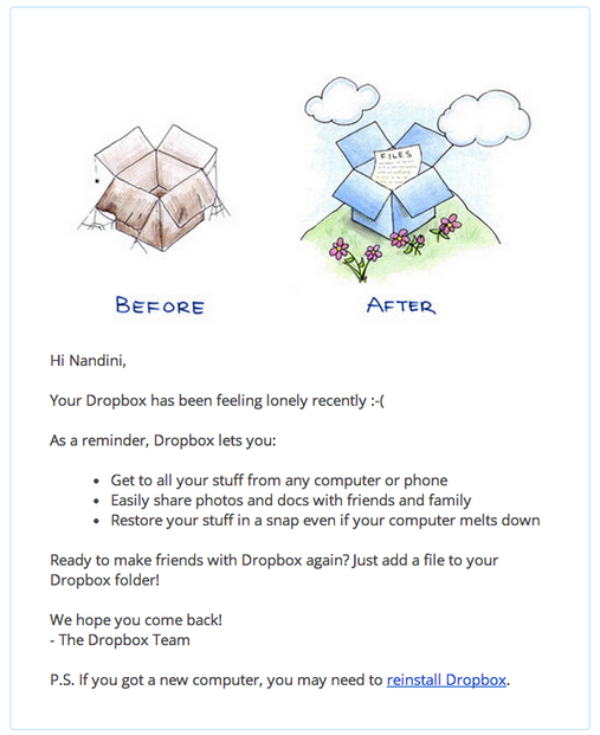 Dropbox uses trigger emails to reinforce their message, as well as to remind customers that they’ve been missing out on its use. These reminders bring cloud storage back to the forefront of their mind. Take a look at your own product, and ask yourself, what are the actions that add value to your users? Then, set up automated, trigger-based emails to encourage people to take those actions, all the way from completing your onboarding process to using your product on a regular basis. It’s hard to see your churn rate go down when you’re trying to sell to people who’re not a right fit. This results in churn simply because customers fail to receive or understand the core value of your service or product, usually because they’re after the free trial use or they don’t suffer from the problem your product addresses. So if you’re targeting the enterprise sector, you may be better off without a freemium version of your product. Some companies don’t even offer a free trial. Business customers have spending power, and if they receive value they can consider opting for a yearly or even longer subscription. WP Curve doesn’t have a freemium option for its customers. Plans start from a standard package, and anyone who requires a one off job has to pay $79. The profits of WP Curve have been growing as they’ve been working with an audience who’re most likely to continue using their product. While offering free trials isn’t always a bad thing, don’t let it take a toll on your business. If the only attraction you can provide is a product free of cost or free for a certain time period, it is time to re-evaluate your strategy. The more customers spend time using your software, the stronger will their demand for greater control will be. The makeup of your SaaS product and plan should enable them to grow with your service through configuration, user-generated content, and personalization. The more control you give to customers to customize the product to fit their business needs and processes, the greater will be the value they receive from it, and the stronger the continued usage potential will be. For example, A CRM SaaS product that allows the user to organize contacts in a way they desire after months of use will be more valuable than a product that only offers one method of organization. 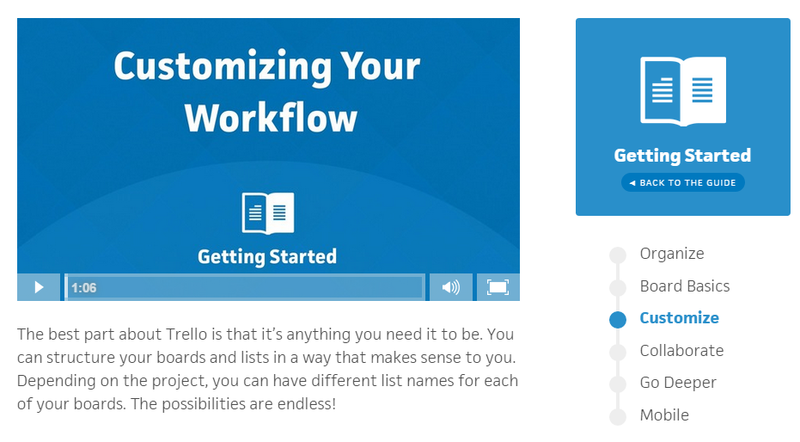 Trello offers its gold and business class users a lot of ways to grow. They can organize the dashboard as they desire, and also change the branding such as the background color. When users see their business grow and have increased dependency on your product, they’re more likely to stay. Provide social proof of why your SaaS product is unique through case studies, white papers, testimonials, etc. Even young companies without several years of business operations under their belts can provide examples of how their product is working to make lives of people better. Third party proof will give existing customers a comparison to weigh other companies against you, while substantiating your claims and reinforcing your message. For example, x number of users are a part of this SaaS product family – this can make existing customers feel proud that they’re using something that many other individuals have put faith in. 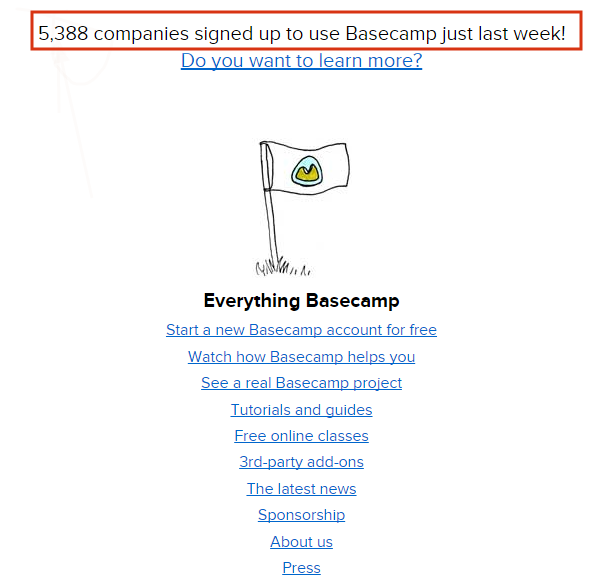 Basecamp’s landing page shows how many companies have signed up to use the service in the past 7 days from the time you visit their homepage. So if an existing customer is thinking of parting ways because they’re unable to figure out how to benefit from the tool, they may give it another go and make greater effort to learn how to gain value from it considering so many others rely on Basecamp. Letting other companies create complimentary offerings of your product is a great way to increase its value and make it difficult for customers to discontinue their subscription. You can either invite companies to build add-ons or get your product integrated into another SaaS product and vice versa. When customers are in the mood to unsubscribe or cancel, you need to give them a compelling reason to stay. And what’s better than giving them a new way to use your SaaS product? Shopify offers its enterprise users a way to connect their store with existing IT platforms to create a seamless solution. They can use the company’s API to connect to their preferred CRM, ERP, accounting systems, and other software. Shopify also gives an option to source a custom connector. If you don’t want to be associated with another SaaS company, you can create value by partnering with app developers to create a mobile version of your product. The aim should be to provide users new ways to use your product. One lesser known reason for an increase in churn rate is the expiration of payment cards. When this happens, your billing system fails to process recurring payments from customers, and you only lose a customer because their credit card wasn’t renewed. The workaround this problem is to use a billing system that provides credit card notifications, which informs users automatically that their credit card is about to expire and they need to renew it in order to continue using the service. Intuit gives an example of a message that can be sent out to customers to remind them of the expiry. Just taking this simple action can make a significant difference to SaaS churn, as one of the reasons behind it is that customers forget to update their billing information or renew their subscription. SaaS companies that enjoy a low churn rate do more than just build a great product. They create a process that makes their customers keep coming back for more. To conclude, do your best to remind customers why they signed up and what is at stake if they cancel their subscription. What about you? What are your best practices for reducing churn? I’d love to hear them in the comments below. Dan is a professional blogger and consultant who helps Internet startups grow with online content. He has years of experience with online marketing, including social media and content marketing strategies. It is nice article, just to inform you that all the images are broken on this article. I am subscribed to a SaaS company. I bought their product on a yearly subscription basis. Renewal rate is 6 times lesser than the subscription rate and any new product they offer is discounted at floor price rate for regular customers. I like a Saas that operates that way, It makes customer happy and continue to stay. Provide no incentive to existing customers and expect all of them to leave. Sorry about that, seems to be an issue with our CDN. Looking into it now! I personally hope this trend toward Saas dies out. The last thing we need is M$ Windows as a service. Even if the cost is ultimately cheaper, it’s just something about having another bill to regularly pay that rubs me the wrong way. It used to feel like you actually owned the software you spend $400 to own. Really nice post but have a problem with this. there is some issue in webpage when I’m open it with my chrome some images are broken but in my phone all things all right. For those of you, like myself, who haven’t heard the term SaaS until now….. it stands for “Software As A Service”. That’s all I’ve been able to figure out so far! It is an interesting article though. Thanks! Great article! Simple and robust. Gives flexibility in using even advanced survival curves estimation. some images are broken but its ok.. I for one trust this pattern toward Saas ceases to exist. The exact opposite thing we need is M$ Windows as an administration. Regardless of the possibility that the expense is at last less expensive, it’s simply something about having another bill to frequently pay that annoys me. It used to feel like you really claimed the product you burn through $400 to possess. It’s all about moving your customers from customers to brand evangelists.